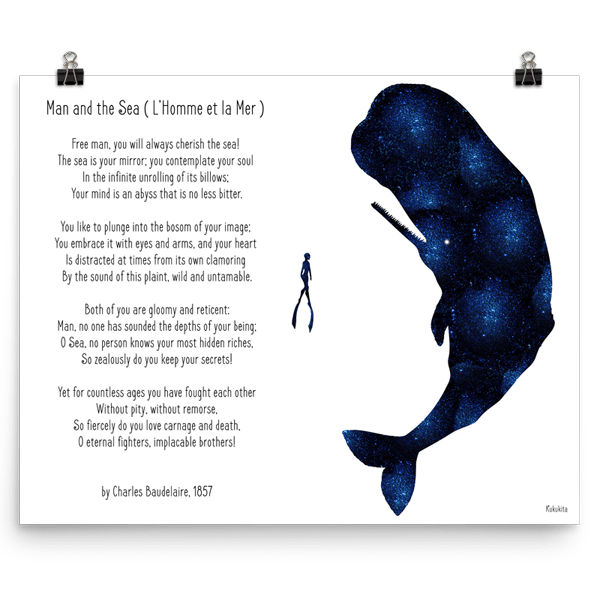 A poetry poster of Man and the Sea, a French poem that I illustrated. It is made with nail polish and it represents a sperm whale and a diver. It features Charles Baudelaire's poem Man and the Sea ( L'Homme et la Mer ). 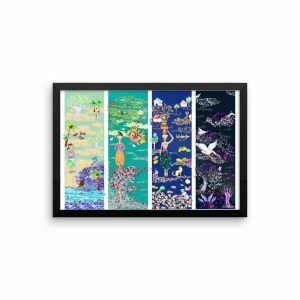 It is a perfect gift for those who love the sea or those who wish to have a marine touch to their interior! Museum-quality posters made on thick, durable, matte paper. This poster is printed on archival, acid-free paper and printed in U.S.
– Paper: Enhanced Matte Paper Poster. – Ink: Brother GT-3, water based pigment inks. GT-3 inks are CPSIA compliant and Oeko-Tex™ certified, which means they are safe to print on youth/children’s clothing and reduce environmental waste. – Several shipping options to choose from – they can range from within 1-8 business days (1-20 for international orders) depending on the courier and level of service you select. – Delivered in a tube, we offer international shipping. – Please allow up to 2-7 business days for processing and shipping. – I will send you a tracking number when your package has shipped. – The photo frame is not included. – The appearance of colors may vary from monitor to monitor. – This design include a simulation of glitters. All images, designs, and text are copyrighted and cannot be stored, reproduced, or used without obtaining prior written consent from the owner.